How can an Ambulatory Video EEG help your patients? Why would you need Video combined with Ambulatory EEG? What are the advantages of using In-home Video EEG? Our lightweight, wireless equipment allows patients to move about at home and be more comfortable during the study. In-home Video EEG significantly saves in healthcare dollars over inpatient stays for similar service. What are the disadvantages to inpatient Video EEG? Removing a patient from their normal living environment can lead to poor diagnostic yield and lower patient satisfaction. Inpatient setting is an artificial environment with little stress, and daily activities that are not “real-life”, so at times nothing happens in this setting. Inconvenience of admission to hospital, which may not be feasible due to home or family obligations, distance, time off work, and having an accompanying person. Availability and wait time: many epilepsy centers have a significant waiting period of weeks to months. Travel for patients to the closest monitoring unit may be inconvenient. Much higher cost compared to in-home EEG-video monitoring. How good is the quality of In-home Video AEEGs? The quality of our AEEGs are comparable to that of an EMU stay. The wires are affixed with Collodion, our Monitor Technologists log into the study twice a day to check on the quality of the video and leads. 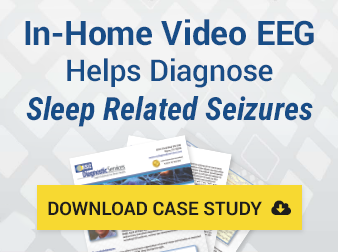 Can quality be assured during an In-home Video EEG study? Using technology with real time assessment to preserve study integrity. Identifying issues and correcting them before study completion. Utilizing highly trained Technologists that are required to provide exceptional patient care, support, and data analysis. Securing the wires with Collodion. Instructing set-up Technologist to stay local and will be readily available and willing to answer patient questions for the duration of the study as well as assisting with any patient discomfort or technical malfunctions. Requiring a CLTM to log-in to a study 3 times a day at regular intervals to check on the patient and the data acquisition of waveforms/video/sound at regular intervals for quality assurance. How long does it take to get a completed study back to the Physician? RSC is committed to completing a patient study within 3 business days. Faster if need be. If an RSC recommended epileptoplogist is conducting the interpretation, the turnaround time can take 3-5 business days. What duration of AEEG's does RSC offer? RSC provides At-Home Video EEG monitoring at 24, 48, 72, 96, and 120 hour lengths. Who dictates the final study that is ordered? Referring physicians can elect to read their own studies, have a neurologist of their choice read the studies, or have an epileptologist recommended by RSC read the studies. How do we view the scanned study? You will access Persyst through the RSC website with your login name and password. Once logged onto Persyst, you will see your folder on the Persyst desktop with the reports. Login again to Persyst Mobile, which is where your patient study will be. In Persyst there is just one patient study file. You can toggle back and forth using the VC (Virtual Clip tab) to see the pruned and clipped files with annotations and comments. Do you accept all local insurance providers? Yes. We provide services to most insurance providers including Medicaid and Medicare. If we are not contracted with a particular provider, we have a DSA so that every patient can complete the study. Who does the VOB and preauthorization of a patient’s ordered EEG? Our Scheduling & Billing Specialist begins the VOB and pre-authorization (if needed) upon receipt of the order. RSC will contact your patient for any necessary co-payments or payment arrangements. Do we need to sign a contract with RSC Diagnostic Services? Absolutely not. You can order your first patient study today without problem. We can work with your billing department to find a DSA that works best for your practice if you have special requests. How do I order a study? Find out on our How It Works page.